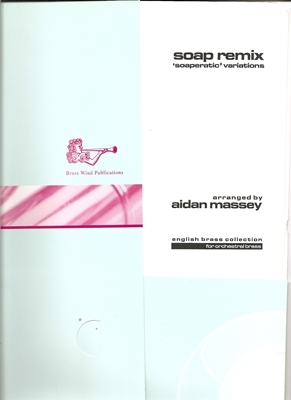 "...Aidan Massey's Soap Remix, is scored for the standard orchestral brass line-up. The work comprises a set of five variations on the theme tune to the BBC soap opera Eastenders: Fanfare and Variation 1, Gymnopdie, Espagnole, Chorale and Fugue. As hinted at in the titles of the individual variations, Massey draws on a potpourri of musical styles and well-known works from the classical repertoire in his treatment of the theme. A glance at the score will reveal that this is a skilfully constructed showpiece for orchestral brass and a guaranteed audience pleaser. It is a challenging work demanding a high level of technical proficiency, and an ideal item for youth orchestra brass sections."